It’s been over 20 years since our church put on a “Living Scenes of Easter” play. One challenge back then was to dramatically present the ascension scene. Rather than provide fodder for America’s Funniest Videos, we decided to handle things simply: we would create smoke using dry ice to simulate Jesus ascending into the clouds. It worked well. Most of us are aware that forty days after his resurrection, Yeshua ascended into heaven. We would do well to reflect upon this ascension. The fullest ascension account is found in Acts 1:9-11. Final “goodbyes” are the most difficult, like bidding adieu to a dying parent or sibling. Those last few moments can be tough to process. The early believers had to experience that sort of grief—twice! The Apostles and early believers had experienced the traumatic devastation of the crucifixion followed by the ecstatic exuberance of the resurrection. It had been an amazingly bipolar experience. After the high of the resurrection, the disciples now had to brace themselves for a different kind of loss. Jesus’ departure to heaven was bitter-sweet: He had to return to His Father’s throne and thus initiate the age of the Holy Spirit (John 16:7). Jesus’ ascension is connected both to the resurrection and to his second coming. It is an extension of the gospel and a foundational belief that has important ramifications. First, let’s survey the information Luke gives us about the Ascension in Acts 1. The passive voice in verse 9, “he was lifted up,” makes us wonder who did the lifting. The answer could be the Father or the Spirit. While on earth, God the Son incarnate made Himself obedient to the Father, yet He worked his miracles in the power of the Spirit. In other texts, the emphasis is that He simply ascended (Eph. 4:8-9). Just as the Father (Acts 3:32), Son (John 2:19), and Spirit (Rom. 8:11) all are said to have resurrected Jesus, so perhaps all three divine persons had part in the ascension. To where did He ascend? The fact that two angels (appearing as men) were on the scene suggests that Jesus returned to heaven. In his sermon at Pentecost, Peter taught that Jesus ascended to heaven (Acts 2:34). In Acts 1, the angels asked a rhetorical question about why the apostles were gazing into the sky. They explained that this same Jesus would one day return to earth just as He had ascended from the earth. The mention of the cloud in our text is not merely for purposes of atmosphere (that’s a joke, folks). The fact that Yeshua was enshrouded in a cloud could connect the event to the cloud of God’s glory seen throughout the Old Testament, the Shekinah. It also would bring to mind the prophecy of Jesus’ return in Daniel 7:13-14. And to him was given dominionand glory and a kingdom, that all peoples, nations, and languagesshould serve him; his dominion is an everlasting dominion, which shall not pass away, and his kingdom onethat shall not be destroyed. Both the Acts account of the ascension and the prophecy of Luke 21:27 connect Bible readers to the Daniel 7 passage. Thus Jesus’ ascension was, in essence, a return to the Father. Second, let’s note some implications we can draw from the Ascension. 1. The ascension tells us that Jesus’ work of redemption is completed. Christ has finished His work of providing salvation. This is why His physical presence on earth was no longer necessary. He died once for all mankind (Heb. 10:10), rose once from the dead, and ascended once to glory. Now He has “sat down,” thus implying rest after He had completed His earthly mission. Through the Lord’s Supper, we remember what He did, but His ascension stands as a testimony that the work is done, complete, perfected, and finished. 2. The Ascension testifies that Jesus is now exalted. To be seated at the Father’s right hand means He is seated in the place of privilege and authority. As Jesus stated before ascending, “All authority has been given to me in heaven and on earth” (Matt. 28:18b). The right hand is a visual representation of authority. When God the Son became Jesus, a perfect human nature was melded to His divine nature. Thus, when Jesus ascended, God the Son returned to the place of authority He had before He emptied Himself, but now with a human nature forever united to His eternal divine nature (see Philip. 2:5-11). Third, let’s note some additional applications that affect our devotional lives. 1. We can take heart that Jesus is preparing a place for us. In addition to sitting at the Father’s right hand, exalted, He is also adding room additions onto His Father’s house for us (John 14:1-6). 1 John 2:1 states, “My little children, I am writing these things to you so that you may not sin. But if anyone does sin, we have an advocate with the Father, Jesus Christ the righteous.” Jesus rises to defend us against Satan’s accusations, as He is also pictured doing in Zechariah 3:1-10. The Book of Hebrews develops the theme of Jesus serving right now as our high priest. 3. We can recognize that the Holy Spirit and His gifts were triggered by the Ascension. In 2 Kings 2, Elisha asked Elijah for a favor before he ascended into heaven. He requested a double portion of the Holy Spirit. In a similar vein, Jesus taught He must ascend to heaven before the Spirit could come in His Pentecostal power (John 14:16ff). 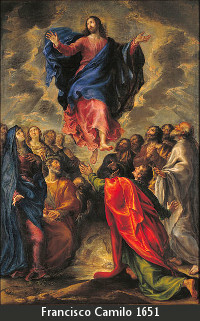 Although the disciples had to wait ten days after the ascension for Pentecost, the coming of the Spirit needed to be preceded by the ascension. Ephesians 4:7-10 connects the events. The implication is that the gift of the Spirit—and the gifts that come by the Spirit—would only be given by an ascended Lord. The Ascension of Jesus Christ is historical fact, but it is more than mere history. It is also rich theology. Our Lord is ascended! Blessed me to read this, Ed. Nice survey of the doctrine, context and some applications. I was encouraged and my heart was "re-calibrated" by reading this today! If you'll forgive this entirely personal observation: "Nord Zootman" ... hard to explain exactly why, but I really like the name. For one thing, it really resonates... literally. I've never met another Nord and Zootman's are rare so, good or bad, I never get mistaken for someone else. Total different subject - I have prayed for your career situation several times as the Lord has brought you to mind ever since you shared concerning your resignation. Aaron, Nord is one of my best friends. Nord means from the North (he tells me), and Zootman means man from the South. So, whenever I need DIRECTION, I ask Nord! A lot of truth in that, actually!